After delivering a healthy baby girl, new mom Tina Muir is itching to return to her pro running career. Deciding to start a family is a huge deal—especially for runners, and even more so for professional runners. “You are essentially giving yourself a two-year injury,” says Tina Muir, the 29-year-old who made her lengthy battle with amenorrhea public last year when she announced that she was leaving the professional circuit to focus on becoming a mother. 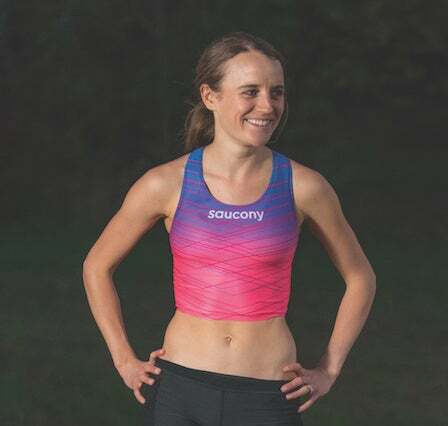 After years of experiencing the highs and lows of the love-hate relationship so many have with the sport, Muir ultimately came to her decision after running for Great Britain in the 2016 IAAF World Half Marathon Championships, thus accomplishing a significant career goal. In January, Muir and her husband welcomed a healthy daughter named Bailey into the world—and, less than one month later, Muir was already planning her professional return. Congratulations on the birth of your daughter Bailey! How are you now? Thank you. It’s strange, because people keep saying to me, “How are you?” like I’m sick. But to be honest, it’s not been as bad as I thought it would. Obviously there are going to be ups and downs, but I think because I’m such a Type A, busybody person, since I’m just doing this–I stepped away from work–it almost feels a bit relaxing, because I’m just focusing on her needs. It is intense being tied to a human being who needs so much, but at the same time, I’m thankful that I’m not busy, because I feel like I’m just in the moment. Usually, you’re thinking, I’ve got to do this, I’ve got to do that, just living life. [Bailey] is asleep on me right now, so I’m looking at her. She’s great, and it’s been really amazing–even better than I expected. How did you make the decision to leave professional running? I had reached a crossroads in my running. It wasn’t that I never wanted to run again, but I’d reached a point where I needed a break. I still had things to accomplish, but I also had amenorrhea; it was a thorn in my side that was bothering me. When my niece was born, that made me aware that there are more things in life than running. The decision was a hard one, because it isn’t just something where you can say, “I’ll take a month off and be done.” You are essentially giving yourself a two-year injury. I’ve never had a real serious injury; I’ve never had to take more than a month off. It was a big decision I had to make, and potentially I could never come back. I could get to the point where I never want to run again, I could be at the point where my body wouldn’t want to run again. I don’t know if that will be the case, but I had to make a decision where I’d have to be happy with what I achieved in my running career if I never got the chance to go back to it. For me, having run for Great Britain the year before, that was my number one goal. Even though I still have things to do, that was the one thing that I knew I had to do before I could be satisfied–and I had. How do you want running to be part of your life as your body heals? Three weeks into my postpartum journey, I already feel that fire. I want to come back to prove that it can be done. There are role models out there who have inspired me, like Stephanie Rothstein Bruce and Kara Goucher, who have come back. I’ve decided that I want to be open and vulnerable and share every part of this journey: all the ups and downs, allowing people to see what it takes to come back. People think it’s easy for elite runners. Although I did run during pregnancy, it was very slow, very easy. I’m looking forward to showing that I can get back to where I was, and maybe even beyond, with a new lease on life. What was your path to becoming a runner? I didn’t like running at first; I fell into it. I actually hid in the bathrooms at school when tryouts were going on. The first thing I really remember is finishing fourth at one of my town’s cross-country races. I remember thinking, Fourth isn’t really that far away from first. I wanted to win. I remember that being the day my competitive drive was awoken. I’ve always been someone who’s shared probably a bit too much, and allowing other runners to see that, yeah, even though I’m running quite fast in their eyes, everyone goes through the same things, from the very top to the very bottom. Even in those early days when I started seeing success, I don’t think I thought that running was so fun; it became one of those childhood things where you’re kind of good at it, and because you’re successful with it you think, This is quite fun. Throughout my high school years, I became more and more dedicated to it. Towards the end, my final year in high school, I took a bit of a dive. I tried too hard to keep juggling too many balls that I couldn’t keep up in the air with a social life, my schoolwork and running. Running unfortunately was the one that got dropped and my social life took over. My running took a big nosedive for about two years. I gained a lot of weight and I really lost all my fitness, since I was just doing the absolute bare minimum. During that time, I never thought about giving up running, but it was very low on the priority list. I wasn’t secure in who I was, and I allowed the temptation of a partying lifestyle to overcome my passion for running. Then during my college years, I did come to the U.S. for college. Being back in the environment where people took running very seriously, really enjoyed and had passion for it, seeing how much time they put into it–that rubbed off on me. I was determined to prove a point–kind of in the same way I am now–that I could come back, that I had more in there and what people were seeing of me at that moment was not what I was capable of. I worked really hard and I started to love it. As I had more success, that brought more love for it. It took me about a year to get to a reasonable fitness level after slacking off for a few years. I really became in love with running at that point; it meant so much to me. By my junior year, it went too far. I became obsessed with it; I know most runners have been through this, where every waking minute of your day, you’re thinking about it. Every morsel of food you put in your mouth has a purpose. Every second of the day you’re thinking, What can I do to be a better runner? Even though that sounds great, it never works. We always end up obsessed with it, and then any little injury that comes up, you just absolutely crumble to pieces, because you feel like you have nothing else to offer, and your whole identity is tied to running. I went through a stage of that for about a year. I don’t think it’s any coincidence that I had more injuries that year than I’ve ever had in the rest of my running life. I was out of balance, I was unhealthy, I was doing too much too soon. Once I got myself back into a good place, I was in that place for quite a few years as I moved into my professional running life. I’ve always been someone who likes to do a lot of things, so I was doing my master’s while working as an assistant coach at La Salle in Philadelphia, and running wasn’t the priority but I still took time for it and loved it. I did one summer as a full-time professional athlete after I finished my MBA, and I hated it. Again, it came down to that obsession, the balance thing: I couldn’t handle that all I had to give was running. So I stopped that, got a job at Runner’s Connect, and again found that balance and ended up loving it over the next few years, until I finally reached that point a year ago where I felt burned out. What advice would you offer new runners? Don’t put yourself down and think you’re not a member of the club. The running community is so inclusive, so welcoming and full of the most wonderful people. New runners often feel that they don’t belong, they’re not fast enough, they’re not committed enough. But if you’re out there running, you’re doing it, and you should be proud of that. It doesn’t matter how fast you are or how much you run; you’re out there doing it, and that makes you a runner. Soon you will see that everyone goes through the same struggles, from the fastest elite to the brand-new runner. What does your perfect run look like? It would probably be a tempo run. I love the feeling of working out hard, but at a pace where you can feel like you’re in control and able to keep it up, and you feel strong a the end of it. I would probably be on my own, because that’s what I’m used to; as much as I love running with other people, I’ve trained mostly on my own my whole life, so it’s hard to imagine running in a group. It would probably be like 45 degrees, just warm enough on that tempo run to run in a t-shirt and shorts. I would probably be running along a nice, smooth path that’s flat but kind of curved a bit, so that it’s not boring. The community Muir’s spent her entire career embracing is evident on every episode of her “Running for Real” podcast. Launched last April, the podcast features interviews with and advice from industry professionals. New episodes are released weekly and free to download.